After the distraction yesterday that there would be a double A-side “single” released on June 20 (still no info on any physical vinyl or CD as yet), the official and bigger announcement of the new Paul McCartney album quickly followed. Egypt Station will hit stores on September 7, but there’s not a lot of other detail to hand. a single disc CD – UK, US and AUS McCartney stores, Amazon, etc. a “standard” double disc black vinyl LP – UK and US McCartney stores, Amazon, etc. a “deluxe” double disc black vinyl LP – UK McCartney store, Amazon, etc. At present there’s no detail on what differentiates a “standard” or “deluxe” version, but from what we can deduce from the various websites it is all about the packaging. “Standard” double LPs (black vinyl and coloured vinyl) will most probably come in a regular gatefold cover. “Deluxe” double LPs (black vinyl and coloured vinyl) will come in what is described on the Australian McCartney store website as a limited edition, tri-gatefold “concertina” jacket, with a six panel canvas concertina folder. The exclusive vinyl colour is yet to be announced, but they will be 180 gram vinyl. 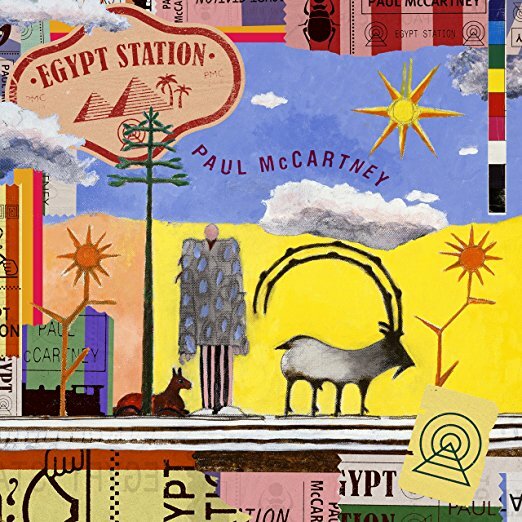 Also interesting is that the UK McCartney store site says that Egypt Station will be on the Virgin EMI label. We’d presume that in the USA it will be on Capitol? For more check out the UK McCartney store, the US McCartney store, and the Australian McCartney store. Paul McCartney appeared on BBC Radio 2 and talked about Egypt Station here. This entry was posted in Beatles, Beatles Collecting, Beatles Music, Paul McCartney and tagged Beatles, Beatles Collecting, Egypt Station, Paul McCartney by beatlesblogger. Bookmark the permalink.